"A much needed guide on how to apply patterns in user interface design"
"An excellent book on patterns in HCI, that is both accurate in content and appropriate in its scope." - Tom Erickson, IBM T.J. Watson Research Center. "The author does an excellent job of explaining how patterns can be used to capture, share and structure user interface design knowledge from their projects and how to use the patterns to allow for better communication among multi-disciplinary teams. ... I seldom come across a book that poignantly strikes a chord where I have personally witnessed so much opportunity for improvement in our field." - Jim Hobart, Brentwood, California (at Amazon Reviews). Welcome to the companion web site to A Pattern Approach to Interaction Design Here you will find specific information about the book, pricing and availability, as well as updates and errata as they become available. While the subject of design patterns for software development has been covered extensively, little has been written about the power of the pattern format in interface design. 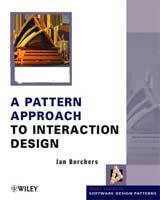 A Pattern Approach to Interaction Design remedies this situation, providing for the first time an introduction to the concepts and application of patterns in user interface design. The author shows interface designers how to use patterns to capture and structure user interface design knowledge from their projects, and how to use them to understand each other's design principles and solutions when working with clients and software developers. As an example, the book also contains a ready-to-use pattern language for the design of interactive exhibits. The Table of Contents for the book is available online. Jan Borchers is Full Professor of Computer Science at RWTH Aachen University in Germany, where he heads the Media Computing Group. He previously worked as Assistant Professor at ETH Zurich and Acting Assistant Professor of Computer Science at Stanford University. He explores post-desktop user interfaces in future learning, working, and performance environments, and continues his work on patterns in Human-Computer Interaction (HCI). He holds a PhD in Computer Science from Darmstadt University of Technology in Germany for his work on HCI design patterns, and an MSc in Computer Science with emphasis on HCI, Graphics, Connectionism and Educational Theory from the University of Karlsruhe in Germany. He spent part of his time at the Universities of Ulm, Linz, and Imperial College in London. He has designed and lead the development of interactive systems since 1995, including a series of interactive exhibits, such as You're The Conductor for the Children's Museum in Boston and the Boston Pops, Personal Orchestra which lets users conduct the Vienna Philharmonic, the Virtual Vienna 3-D city tour (both for a large museum in Vienna), and WorldBeat, an award-winning interactive music exhibit for the Ars Electronica Center in Linz, Austria. He has authored papers for journals such as ACM Multimedia Systems, IEEE Multimedia, and Computers & Graphics, and presented his work at CHI, DIS, UIST, Ubicomp, IEEE ICMCS, WWW, and other conferences. He has co-organized most of the HCI patterns workshops and events in the past, and leads the IFIP Task Group on HCI Patterns. Jan Borchers is a member of ACM and SIGCHI, and the German Computer Science Society (GI) and its software ergonomics group. He can be reached at borchers(at)cs.rwth-aachen.de. For more information about the author, see his homepage. The book was published by John Wiley & Sons in 2001, and hit the Amazon top 50,000 shortly afterwards. See the errata page for corrections to the current book in print. Please drop me an email if you discover any other mistakes. Thanks! Finally, for general, up-to-date information about HCI patterns, make sure to check out hcipatterns.org.